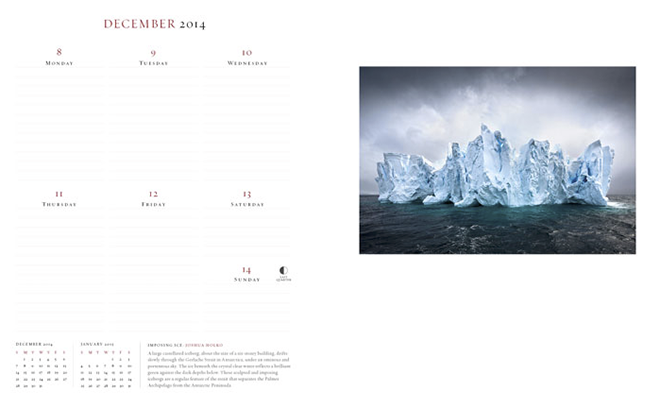 The 2014 Australian Geographic Magazine desk diary was released a few days ago. Featuring photography from many different artists, the diary is a week to a page, hard cover, spiral bound with a ribbon marker. Photographs are taken from around Australia and Antarctica and feature classic Australian landscapes, flora and fauna. The 2014 diary includes more than ten of my own photographs from Australia and Antarctica and can be ordered online from Australian Geographic.